Panasonic Corporation is one of the largest electronic product manufacturers in the world. It manufactures and markets a wide range of products including kitchen appliances, computer peripherals, telecommunication devices, as well as household electronics such as TV, cameras, washing machine, vacuum cleaners, etc. The wide range of products can really enhance and enrich our lifestyles. This article will only focus on Panasonic canister vacuum cleaners. Same as other vacuum cleaner brands, Panasonic also has bagged and bagless canister vacuums. The following are some of the reliable Panasonic canister vac models for your references. It’s a powerful 12-amp canister vacuum with on/off switch on handle. OptiFlow technology helps maintain a consistent volume of airflow through the dust bag and 20% more use of bag. Air Turbine Brush quickly removes stubborn pet or cat hair from stairs. The dual motorized nozzle system allows for gentler carpet cleaning and extended belt life. HEPA filtration system that filters 99.97% of dust, pollens, pet dander, etc. Power Nozzle with Overload Protection reset, Power and Bare floor switch on handle. 4-postion carpet height adjustment for proper carpet height cleaning. 360° Swivel Hose that lets you clean in any direction without the hose getting twisted. Long 24 feet power cord with auto cord rewind eliminates the needs of keep plugging while cleaning. Several on-board tools: Upholstery, Floor and Combo brush, crevice tool, motorized mini power brush and (2) chrome wands. 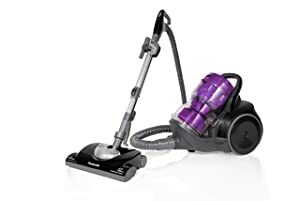 For more info and read the customer reviews of this vacuum here. 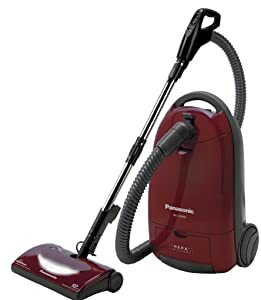 Note: There is another model – Panasonic “OptiFlow” Canister Vacuum Cleaner, MC-CG937 that is very similar to the MC-CG-917 but the price is slightly more expensive. Powerful “bag” canister vacuum with 12 amp motor. Dual-motor nozzle system helps extend the life of the belt and allows for gentler cleaning. On/Off Power Switch and bare-floor option on handle for easy control. A 14-inch-wide nozzle with headlight lets you clean larger areas in less time and easier. Also come with overload protection reset. Using HEPA filter that captures all the small particles such as allergens, irritants, and pollutants. 360-degree hose swivel connections lets you clean in any direction without the 6-foot hose getting twisted. 4-postion manual height adjustment for proper carpet and bare floor adjustments. 24 feet power cord and cord rewind feature with just push of a button. Variety of handy on-board tools – floor brush, dusting brush, upholstery brush, crevice tool and two chrome wands. 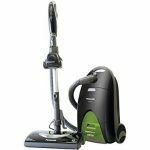 Visit here for more details review and great deal of the vacuum. A cheap canister with11 amp motor, it offers powerful cleaning performance. 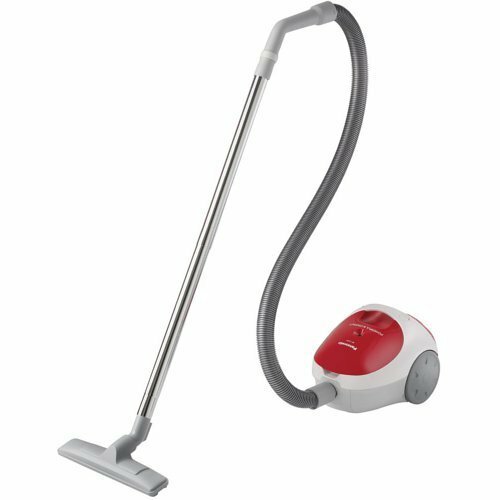 Ultra-lightweight (only 9.4 lbs), ergonomic handle on top make you can easily carry or move around the vacuum. Blower port offer efficient way to extract dirt from hard-to-reach nooks and crannies, blow debris outdoors. Long 17-foot power cord with automatic cord rewind feature. 12-inch wide nozzle lets you clean larger areas efficiently in less time. Two big and soft wheels gentle on floors and make moving the canister vacuum effortless. 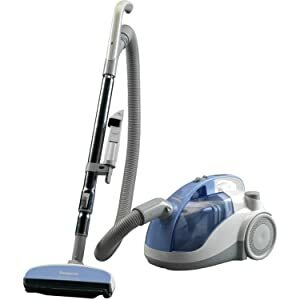 For more info, you can read the real user reviews and check the latest price of this vacuum here. If you don’t want to guess when it’s time to change the bag, or pay for replacements, the bagless system lets you throw the dirt away every time you vacuum. However, we do recommend two models if you want to get a bagless Panasonic canister vacuum. Lightweight and compact design for easy maneuverability. JetForce Cyclonic Filtration – The hourglass-shaped dust cup and 9-cyclonic cylinders separate dirt from the incoming air resulting in powerful suction and a cleaner filter. It uses HEPA filter that can captures 99.9% of small particles such as allergens, irritants and pollutants. Ergo-handle with suction bleeder with the on/off button on the handle. Push a button easy-to-empty, bottom release dust cup allows for quick, clean and easy dirt disposal. 360-degree swivel hose allows the hose to turn and easily clean in any directions. The 6 feet hose, aluminum telescoping wand with 14″ nozzle width and 24′ cord length with auto cord reel let your cleaning job can be done faster. On-board tools include crevice tool and dusting brush. Also, the Pet Turbine brush can remove the embedded pet hair with ease. 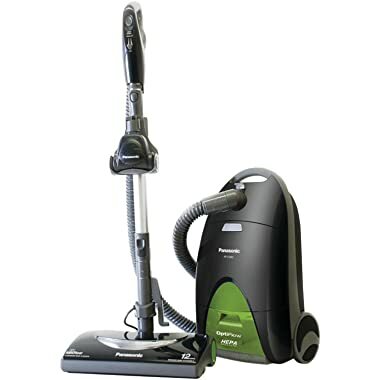 Click here to get more info and reviews of this Panasonic vacuum cleaner. It’s a pretty cheap, 11 amp motor system to deliver excellent performance. 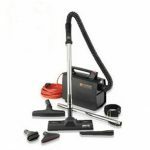 The vacuum is versatile, multi-angle floor nozzle with 10-inch cleaning path. Bagless design so no messy bags to replace and save cost too! The industry standard HEPA filter captures almost all particles such as allergens, irritants, and pollutants. The 16 feet cord is not very long and it comes with auto rewind feature with a touch of a button. The Edge Grabber unique shape conforms and directs maximum suction to these hard-to-clean areas. On-board tools include combo crevice tool and dusting brush as well as Edge Grabber attachment. Visit here for more details info and check the latest price of this cleaner now. 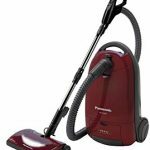 If you want to get a new vacuum cleaner, we hope that the recommended Panasonic canister vacuum models above can really help you get the best cleaner that you need. Of course there are other brands and models available, so just browse through our site and hopefully you will find an ideal cleaner for your cleaning needs.